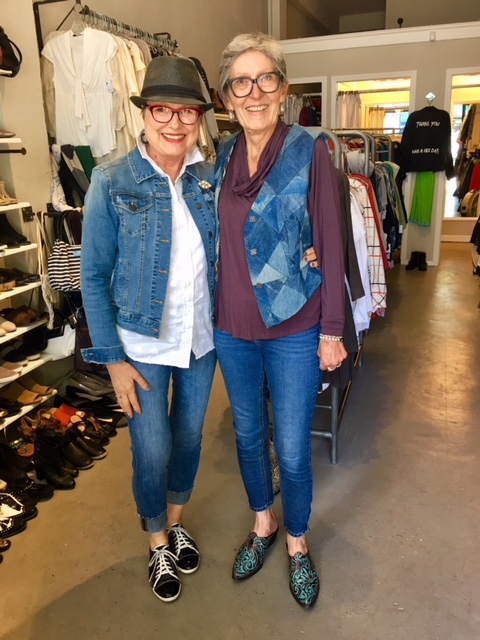 If you were on a scavenger hunt and you were supposed to find someone wearing denim, the place to be would have been at SAX Consignment last week when I stopped by to say hi to one of my daughters who was working at their store that day. 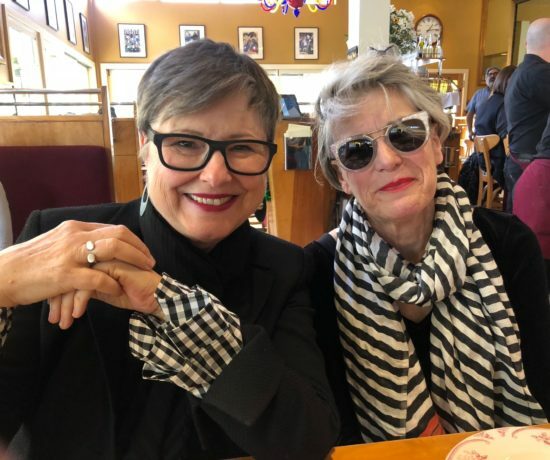 I’d just come from having a casual lunch at Taco Jane’s with girlfriends in San Anselmo. It was my first day in a long time for wearing double denim. 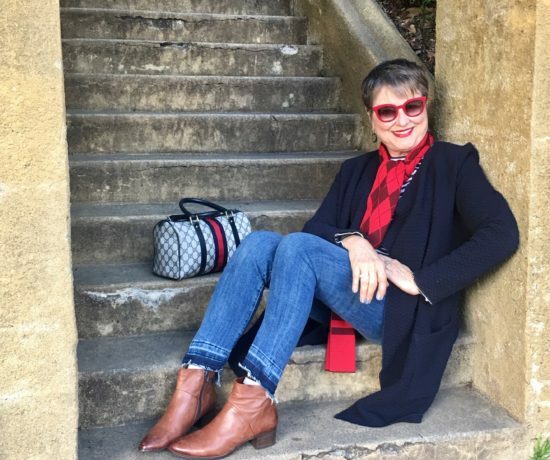 I had on my DL1961 jeans with their frayed hems rolled high, a favorite white shirt of mine by a Nordstrom line called 1901 (what’s with all the numbers?) and my trusty jean jacket and AGL tennis shoes. The store is small but that didn’t stop me from stalking this lovely woman wearing an outfit that I could practically lift from her and wear myself. 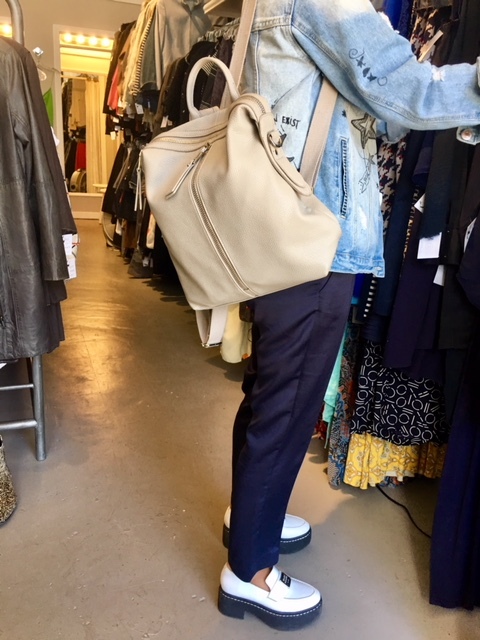 I adored the shiny bright navy ankle pants, her thick soled white patent loafers, her oversized backpack in that lovely shade of whitish-tanish-blushish. 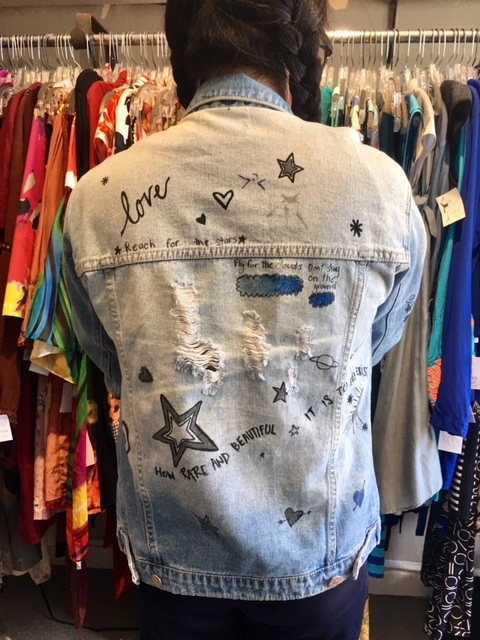 I love mixing fancy with casual, which leads me to the piece de resistance: the hand decorated distressed jean jacket with words on it. Here are some of the phrases written on it: Reach for the stars; Fly for the clouds don’t stay on the ground; How Rare and Beautiful It Is To Even Exist; Love; Shine Bright; THIS IS ALL MINE!!!! I did talk to her and asked her about her unique jacket with stars and planets and hearts and kid drawings. She told me she loved this jacket because her kids were the illustrators. It made me want to go home, pull out fabric pens and start writing on denim! Or maybe for my next birthday, I’ll ask my kids to decorate a jean jacket for me. Wouldn’t that be so fun to wear? Something loved ones had a personal hand in creating? Then I turned around and ran into another jean project! This woman named Dorcas was wearing a patchwork jean vest in multiple shades of denim. Her mother-in-law used to have a boutique on Union Street in San Francisco, and that’s where she found this vest. It’s so well-made! After I admired the outside of it, she showed me the surprise inside. It’s so well-made! After I admired the outside of it, she showed me the surprise inside. 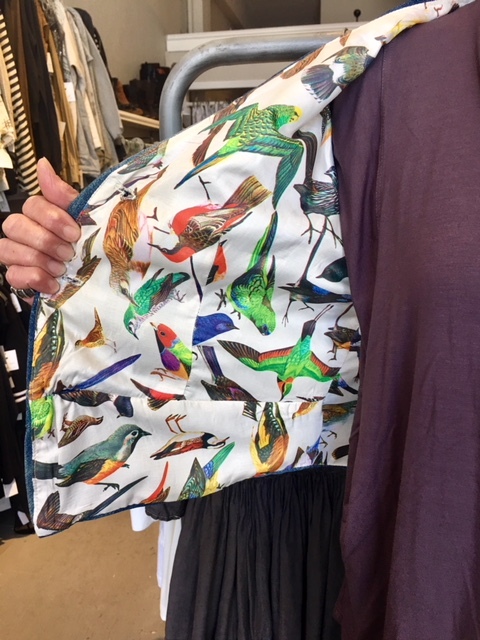 The lining is this beautiful bird print. Denim, birds, patchwork, three of my favorite things. I was thanking my lucky stars that I’d dropped in. When I look at it close in this photo, I would imagine it could be worn inside out! Could this get any better? The only way it could have been better is if it had actually been on the racks and I could have purchased it. 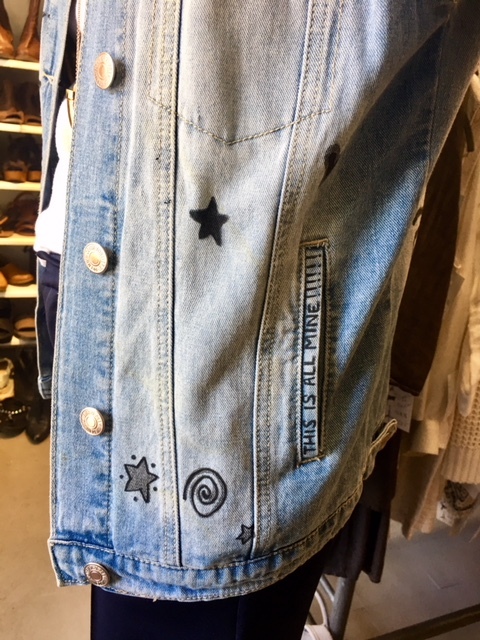 I’ve had my own DIY denim project for the very daughter who was in the store that day. 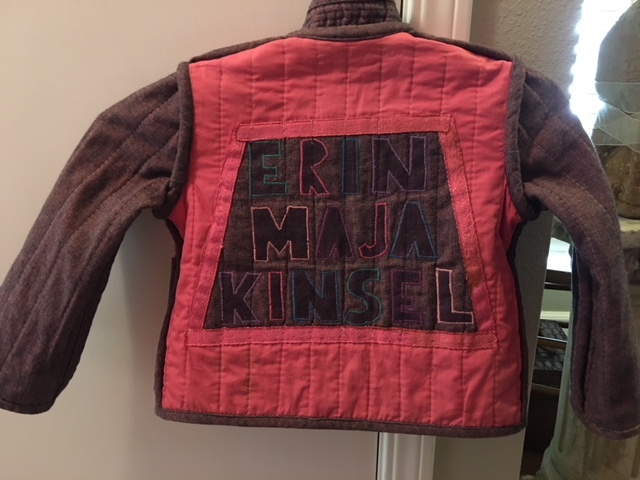 I made this jacket from scratch for Erin when she was about seven-years-old. 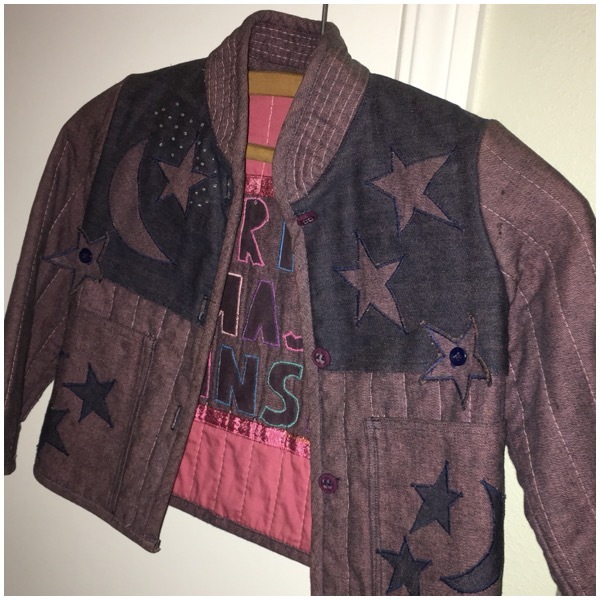 I used the wrong side of the denim fabric (the lighter, pinker denim) to make the front and back side of the jacket, plus the sleeves. I used the right side (the indigo side) of the fabric to make the flaps on the front and back. 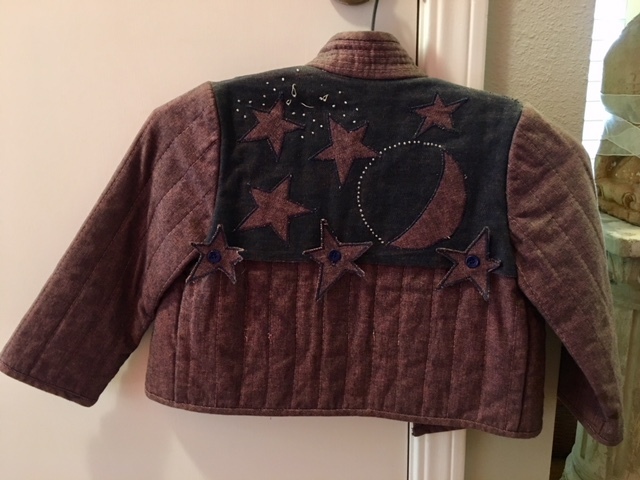 I made star and moon appliqués in both the right and the wrong side of the fabric to decorate it. It was quite celestial. Here’s the backside of it. It’s lost a couple of beads up near the top. The beads represent the twinkling night sky. I added detachable stars in front and back so in case Erin got bored, she could unbutton the stars and put them in different places. She got bored a lot, but she never took the stars off and on. You’ll understand in a minute. Trevor, her big brother, gave me the idea to outline the moon in beads. The other night there was a crescent moon in the sky. I saw that outline and thought of him and his contribution to his sister’s coat. She’d just lost the coat I purchased for her from Macy’s. I decided to make a coat for her that had some form of identification in case she lost this next one. I added her name to the inside of the back. If she left it somewhere, someone could bring it back to her or me. That was my theory…or was it an excuse? I love her name and I loved seeing it here. I loved the playfulness of the letters and colors so I ended up covering the seams to make it officially reversible. Fabric pens is what makes the inside of the letters in her name darker than the rest. I used different colored thread for the different letters. I decided to give her four front pockets. What child doesn’t need pockets for carrying around things like snails and caterpillars? I adorned the pockets with her birthdate. Other than those beads missing on the back, it’s in pristine condition. Why? Because she never wore it. But when she grew up and started doing crafty things herself, she saw it with new eyes. I hang this coat on the door handle of the coat closet in our Sonoma home. Whenever she brings anyone over to the house, it’s the first thing she grabs to show to her friends. Some things don’t get appreciated in their own time. Do you have a love of denim? Do you adorn denim jackets? Maybe you add pins or brooches to them? Do share, would you please? I’d love to hear about your denim affairs. We all would! Oh Sax Consignment is such a serendipitous place! Every time I go in, I come out with something I love that gives a punch to my otherwise somewhat basic wardrobe. And have great interactions with staff and customers. It’s like visiting a little style salon where everyone is welcome! So sweet, Nicole! Next time you go in there ask the staff if one of them is Caitlin or Erin. They are my daughters who own the place. So glad you like it, love your description! I can’t tell you how much I love to read your posts, Brenda!! First off you meet the best people and find such great inspiration. And then the story about the jacket you made. That’s me in a nutshell growing up with my mom. Of course I didn’t appreciate that she made my clothes for me until I was an adult…. 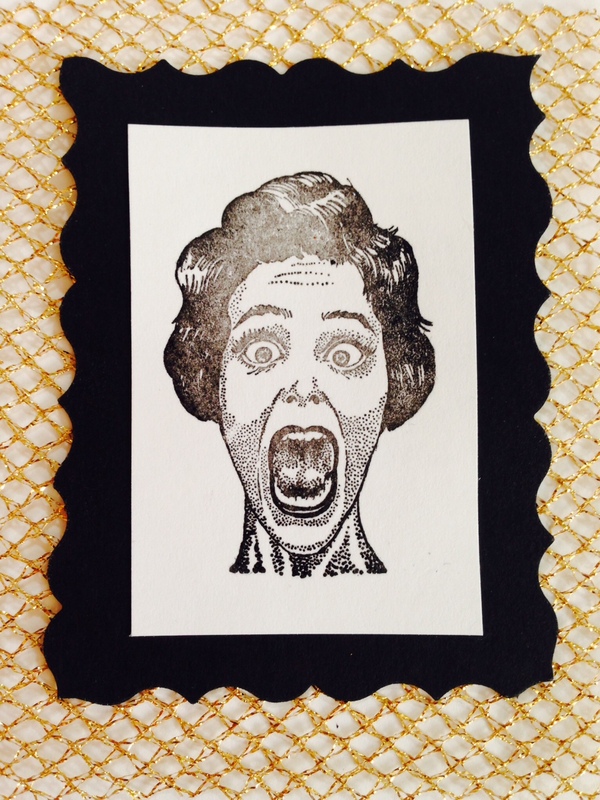 What I love is that my mom continues to make pieces for all 3 of us on the blog….maybe weird, but fun!! It is so great to have you as an internet friend Brenda! 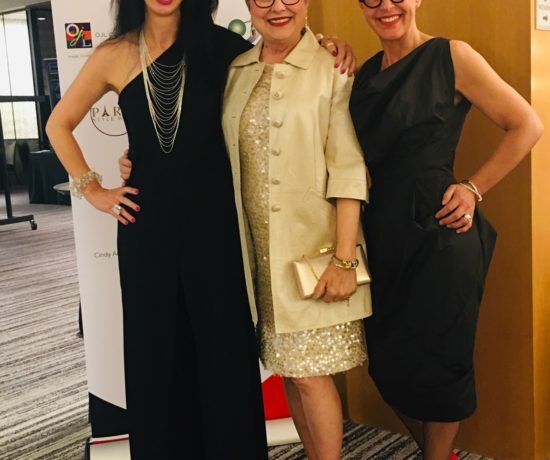 Such inspiration and such kindred spirits! Thanks for all you offer us! What a sweet comment. My heart is full! It’s fun to have an internet friend like you, Robin. Many thanks for being here. That jacket is amazing, Brenda! I had no idea you had this talent also. I hope I get to see the jacket in person some day. 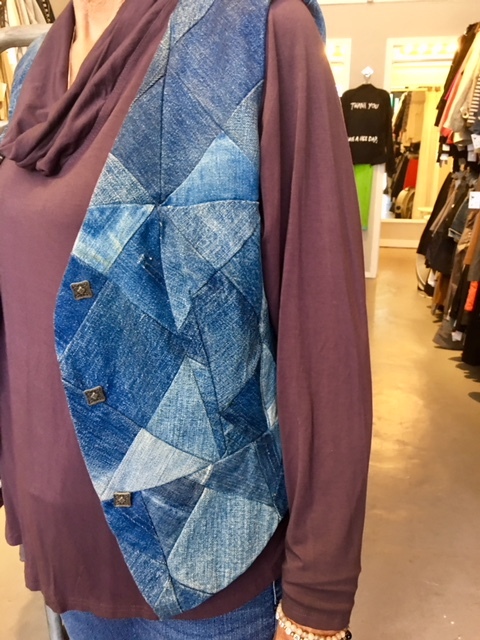 I repurposed a denim shirt into a vest by cutting off the sleeves. I wear it with a dragonfly pin and always get compliments. How clever, Linda. Love it! I love this post. 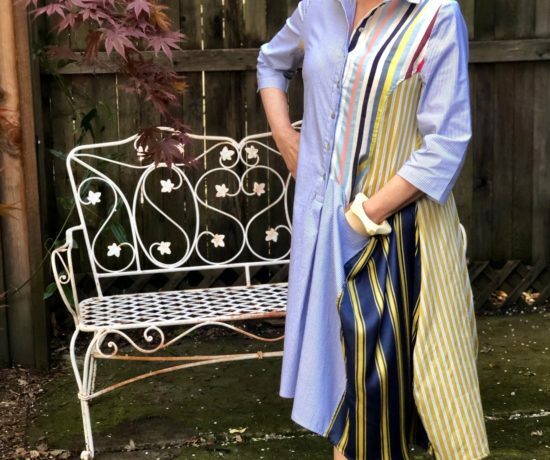 Many of us were blessed to have mom’s that could sew—mine made me so many clothes over the years and inspired me to learn to create also. Thank you for sharing! Thanks, Carol. The clothes my mother made for me when I was in grade school were donated to a cousin who was younger than me. I still think about those dresses and wish I had them to touch and feel and look at again. Lucky you to have had that experience! Very cool! Love the patchwork items. What an inspiring post! I have quite a fabric stash and look forward to trying to use it as creatively as you. Thanks, Brenda. I never appreciated the clothes my mom made me, either, Brenda. So it’s not just you. It’s just fussy daughters with their own sense of style. How I wish I could sew like her now. On another note, check out the kick-a@s shoes Dorcas is wearing! She is one put-together lady. I know! Dorcas looked great head to toe! I’m happy that Erin is so adoring of this jacket now. And the truth is I had so much fun designing it and making it that the fact she never wore it wasn’t such a loss. I had a fun art project for a couple of months. Thanks for sharing, Erika! Not a fan of denim on denim. I do dress up my denim jackets with broaches or floral pins and usually wear them with a dress or dress pants. 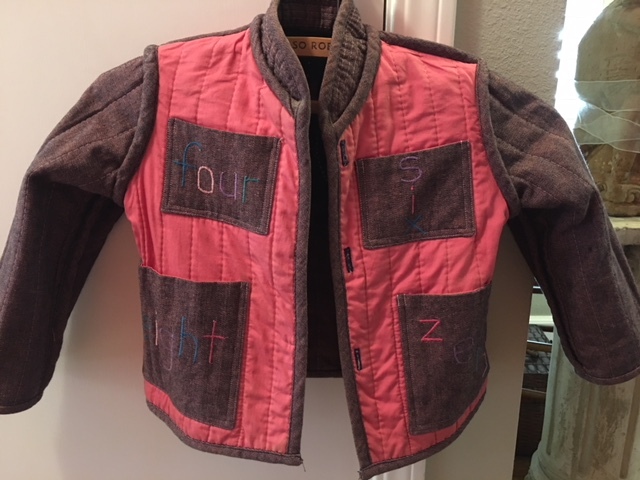 The jacket you made your daughter is adorable however. 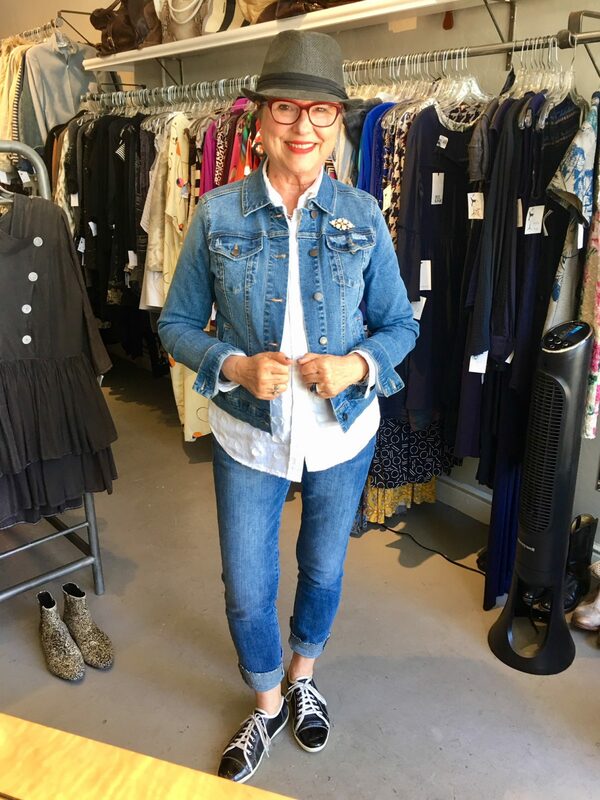 I can picture your way of wearing denim (which is what I do the most as well) and I LOVE it. Just came from meeting a woman who was wearing a silk print blouse, sheer, black pants, nice flats, and black pants. 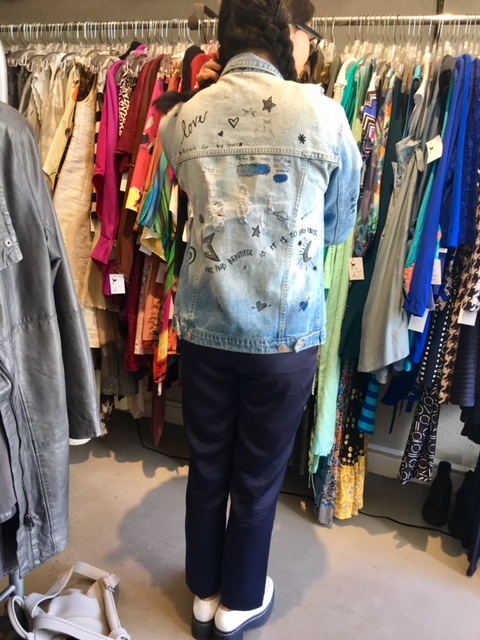 Her denim jacket was a medium wash. She looked fabulous! Oh what a beautiful Mumyou are ! My mother made lots of our clothes, little dresses with puffed sleeves, jeans once, ( I loved those!) Such an enormous effort, I now realise. What a gorgeous rich blog, as usual. This is the most precious story. As mothers, we do so much to let our kids know they’re loved. Your mom took it to a whole new level! Thanks for sharing, Jeanine. I have two patchwork denim jackets hanging in storage in my basement, each lined with a different floral fabric. I made them back in the 1990s, one for me and one for my best friend. When she died of breast cancer in 2006, her husband gave hers back to me and they’ve been hanging side by side ever since. This just gives me chills. I LOVE this. What a great way to remember a friend and honor your friendship. Those are some really unique pieces! Love it! What a fun post Brenda! The next time I am in your area I will definitely stop in the shop, it looks like such an interesting place! I do add pins to my denim jacket, a vintage sterling amber bee pin and my son”s Eagle Scout pin that I was given during his ceremony. I’m such a fan of bee pins. It’s fun to meet someone else who feels the same way. Keep enjoying that denim! 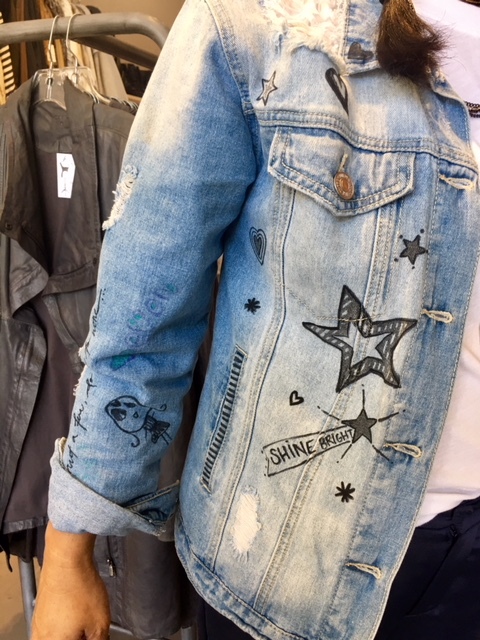 My favourite denim jacket is one I painted myself with fabric paint, to cover up the faded patches – it was already old and soft when I picked it up from a thrift shop. 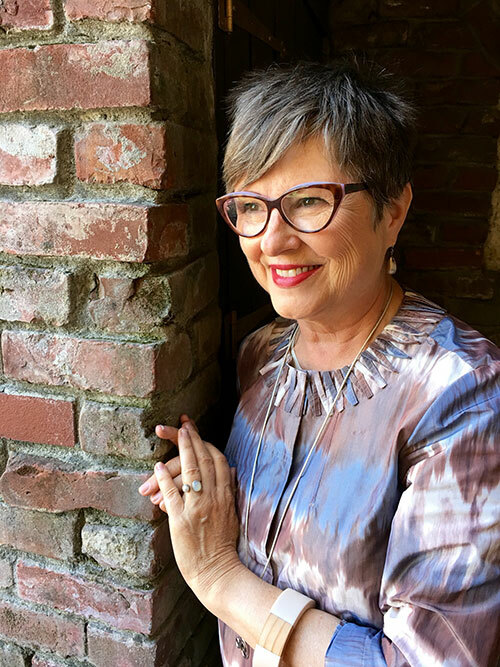 I used to love embellishing my children’s clothes, and we still have a purple corduroy vest adorned with all manner of buttons, rick-rack, small cross-stitch pieces, ribbon bows and anything else I could think of. That particular daughter only wore it once, and now it hangs on the wall as a work of art. I also painted their favourite pieces of art on plain t-shirts. One had Monet’s water-lily bridge, and another had Picasso’s ‘Child With Dove’. Both well-worn and loved, and kept for posterity. 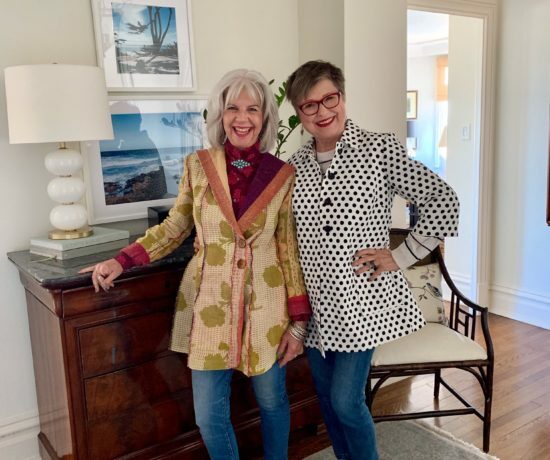 It’s a family thing – my Mum made me a patchwork jacket (when I was in my 20s) which I still have and occasionally wear when I haven’t got too much underneath it – it’s getting a little snug! I’m so delighted to read about your embellishments. It sounds like you’ve had lots and lots of fun. And I love how you’ve hung your work of art on the wall. Isn’t creating fun?? My 81-year-old father just returned the Levi jacket on which I embroidered a tropical sunset scene when I was a teenager. I’m thinking of cutting it up and framing it or turning it into a pillow. The rest of the jacket is a mess. Oh I love love love Erin’s jacket! How I wish I still had the jeans my mother appliqued for me when I was seven years old: a big red flower with a yellow centre on one knee, a big yellow flower with a red centre on the other, and a huge red heart on the backside. Now, I realise that those jeans were wearing out and money was tight, so she patched them…but so beautifully. Now I customised my own denim jacket with silly buttons shaped like skulls and cats and musical notes.